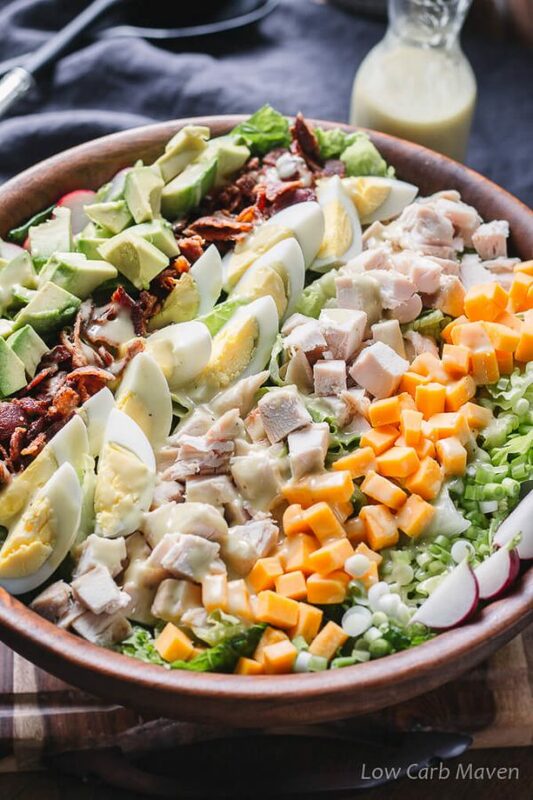 A healthy chicken Cobb salad with a traditional Cobb salad dressing is a hearty and complete keto meal. 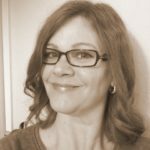 See why I call the Cobb salad the King of salads and learn a neat study aid to remember what goes into a Cobb salad. We eat a fair amount of salads at my house. There’s always a large container of washed and cut romaine in my fridge. It’s part of our Sunday meal prep ritual and makes for quick salads during the week. A great chicken Cobb salad is one of our favorite keto meals and super easy to make. It’s a great “clean your fridge” kind of meal. Cobb salad is a popular restaurant menu item and a perfect choice for anyone watching their carbs. 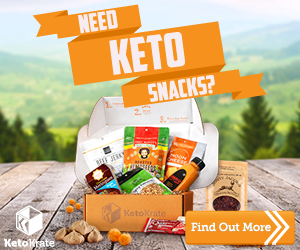 It’s a hearty meal full of protein and healthy fats. A healthy chicken Cobb salad is easy to throw together, making it perfect for a family or a casual summertime meal for guests. 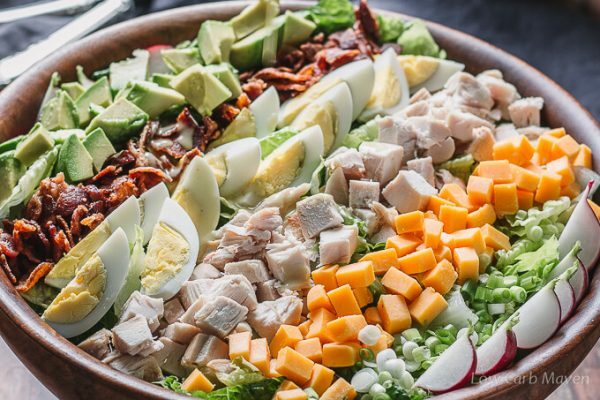 There is a nice study aid to help one remember the ingredients of this healthy Cobb Salad — EAT COBB: egg, avocado, tomato, chicken, onion, bacon, blue cheese. (Paraphrased from Wikipidia) With all of the nutrient dense whole food ingredients, it’s easy to see why a Cobb salad is the “King” of salads. Meat: Try ham, turkey, grilled steak, grilled chicken or fish. Cheese: Try aged cheddar, Pepper Jack, smoked Gouda or feta cheese. Although we usually have grilled chicken in our fridge for our salads, I have made great chicken Cobb salads with poached chicken breast or rotisserie chicken, too. Not surprisingly, a combination of BBQ chicken and smoked Gouda cheese made one of our favorite chicken Cobb salads. 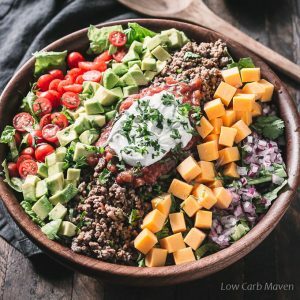 This recipe serves four but if you are looking for a single serving salad with macros take a peek at my Cobb Salad for One. 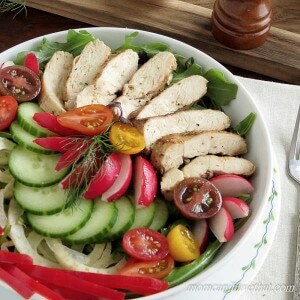 This Chicken Cobb Salad With Cobb Salad Dressing is 4.5 net carbs per serving. 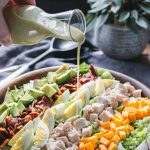 A healthy chicken Cobb salad with a traditional Cobb salad dressing is a hearty and complete keto meal. Toss the romaine lettuce with the Cobb salad dressing (or blue cheese) and divide between two bowls. Divide the ingredients between the bowls. It's traditional to present the ingredients in lines, but they can be added any way you want. 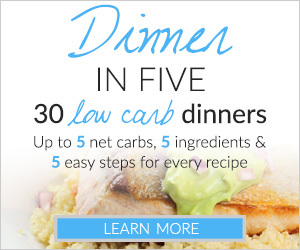 Serves 2, at 4.5 net carbs each. Please see post to see options on making this salad your own. 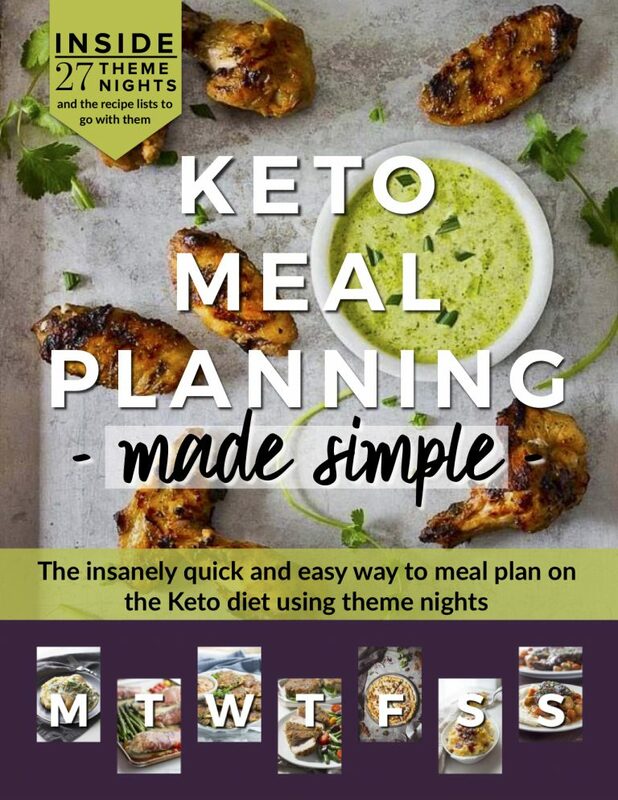 Previous Post: « Keto Chocolate Mug Cake – Moist and delicious! Great looking salad! I know this salad by name but I have never made it myself, although it is quite similar to a typical Romanian salad I make quite often. Minus the avocado and the blue cheese, they are not something belonging to the typical Romanian kitchen. I would love this for dinner tomorrow.